“Before We Flew Like Birds, We Flew Like Clouds” is Seattle choreographer/dancer KT Niehoff’s most transparent and richly humanistic work yet, writes reviewer Michael Upchurch. The show is at 12th Avenue Arts on weekends through April 2. What is it like to inhabit your body? More precisely, what is it like to inhabit your body if you’re an astronaut? Or a speed skater? Or a paraplegic rower? Or a 38-year-old whose heart has stopped? These are some of the questions Seattle’s KT Niehoff poses in her spectacular new show. 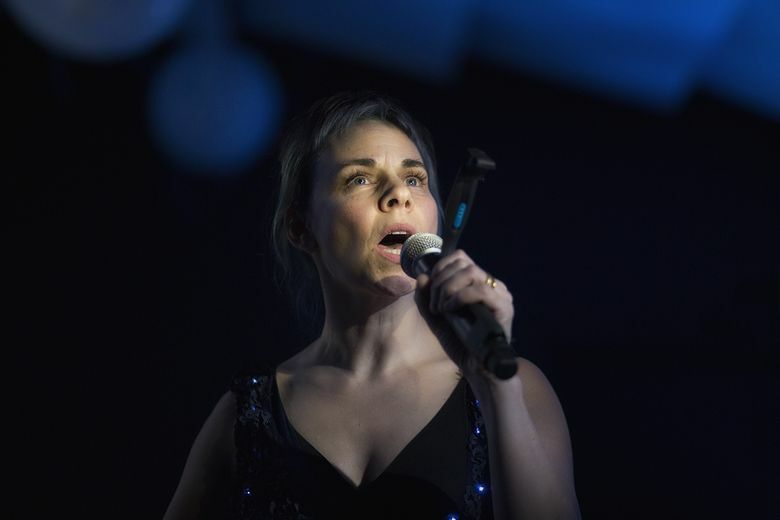 The answers she elicits form an hourlong extravaganza that includes songs, dance, recorded interviews and helium-filled “stars” that drift across a theater space resembling some avant-garde air hangar. Elaborate though it is, “Before We Flew Like Birds, We Flew Like Clouds” is Niehoff’s most transparent and richly humanistic work yet. Its purpose is clear; its focus is tight. 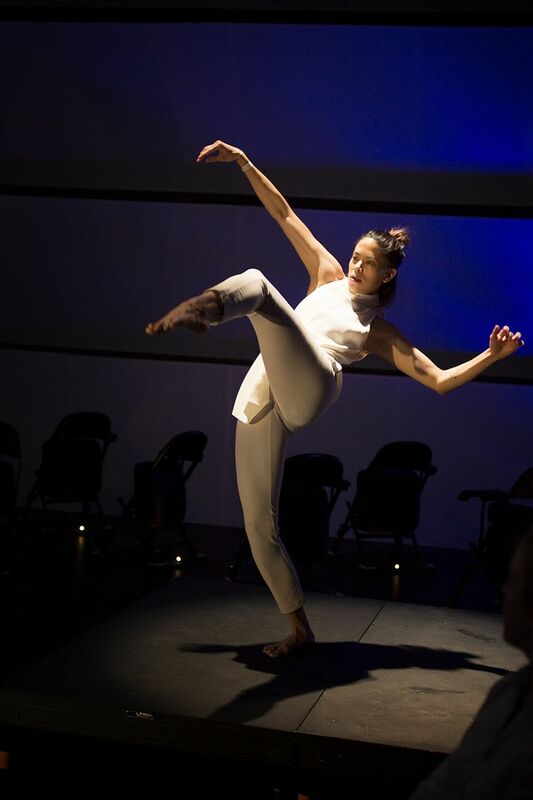 8 p.m. Fridays-Sundays through April 1, Velocity at 12th Ave Arts, 1620 12th Ave., Seattle; $17-$25 (206-325-8773 or velocitydancecenter.org). Interviews with astronaut Soyeon Yi, speed skater Maurice Hall, paraplegic rower Michael Grady and heart-attack survivor Shevanthi Daniels provide the foundation for it. Niehoff is a genial, curious interrogator, and her interviewees are candid, intuitive and humorous. Yi admits that the “total freedom” of a gravity-free environment results in a lot of bruises because it’s hard not to bump into things. Hall acknowledges that topping 40 mph on skates is an unsettling sensation. Daniels recalls being oddly calm and even bemused when dealing with heart failure. Their words alone would be fascinating. But Niehoff is an audio wizard and has digitally manipulated their vocal rhythms and idiosyncrasies to make a kind of music of them. She also co-wrote actual songs with composer Zeke Keeble that she sings with an otherworldly purity and power. Then there’s the visual spectacle. Dancers Liane Aung, Thomas House, Wade Madsen and Alia Swersky move in ways that reflect the ideas being explored. (Whim W’Him dancer Patrick Kilbane, a collaborator on the show, was supposed to perform but had to drop out due to an injury.) As dancers and “stars” weave through the space, viewers seated in chairs that turn 360 degrees can see the action from all angles. The final component: Performers hand out virtual-reality goggles from time to time with short videos playing on them, which vary from patron to patron. Clearly there are as many versions of this show as there are seats to see it from. Action can happen a few feet away from you, or far across the room on small raised platforms. A drifting “star” sometimes bobs into your sightlines, obscuring things. The serendipity is part of the package. Niehoff’s whole technical team — too many to name — all lend magic to her purpose. 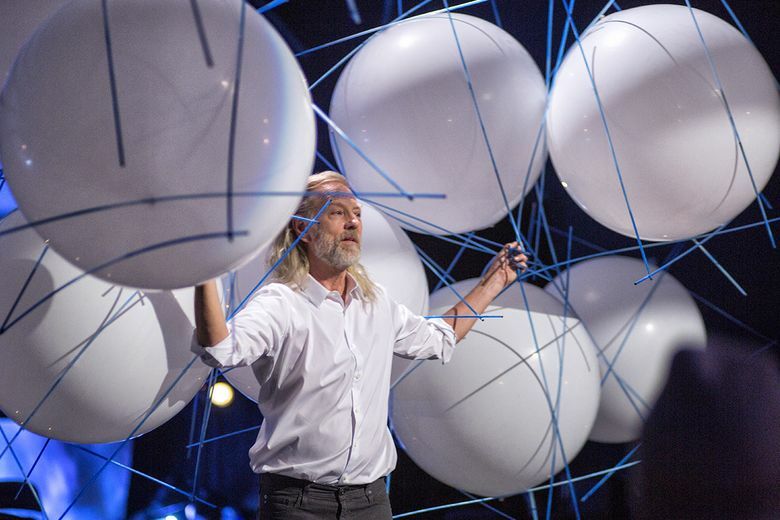 Yet the show ends on a note far removed from high-tech virtuosity. In an exchange between Niehoff and Madsen, she asks what it’s like for him to inhabit his 62-year-old body after more than five decades as a dancer. His answer is beautiful, plain-spoken, sober and serene.